21. The Duke of Gloucester and Earls of Warwick and Stafford chase the Duke of Burgundy from the walls of Calais. 27. 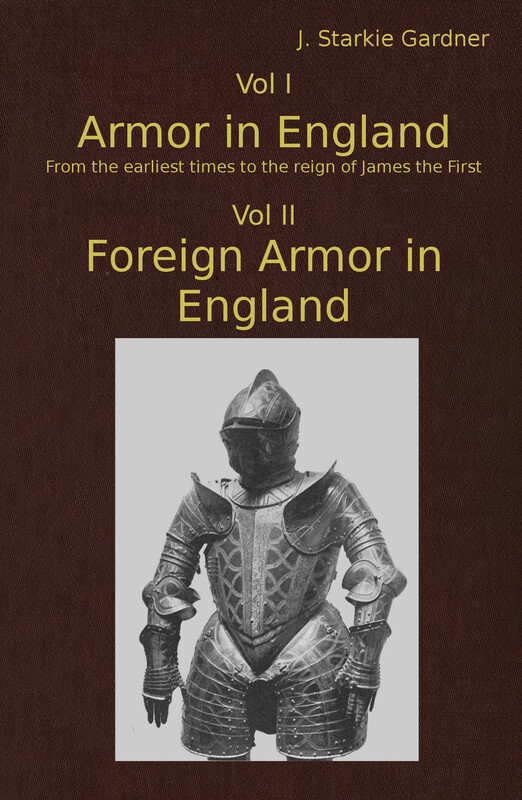 English armet from the collection of Seymour Lucas, A.R.A. I. Painted Wooden Shield of the fifteenth century. IV. Gold Damascening on russet ground. V. Breast-plate, embossed and parcel-gilt. VI. Casque of an Officer of the Guard of Cosmo de’ Medici. VII. Lower part of enriched Chanfron. Suit of Charles I.
VIII. Two Wheel-locks. German and French. 15. Helmet. Presented by Maximilian to Henry VIII. 17. Tilting Helm. Time of Henry VII. 25. Pair of fine Italian Gauntlets. Possibly belonging to the same Suit as the Breast-plate. 26. Embossed Gorget. French, c. 1550. 27. 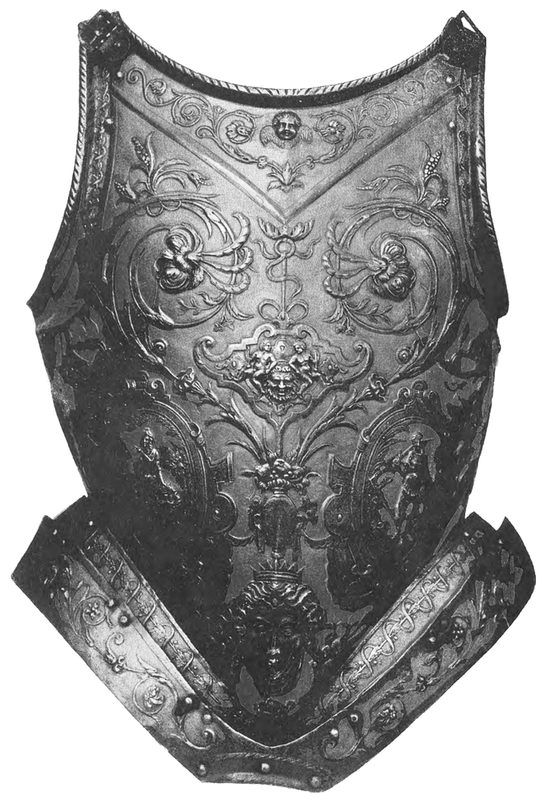 Silver Armor of Charles II. when prince. 28. 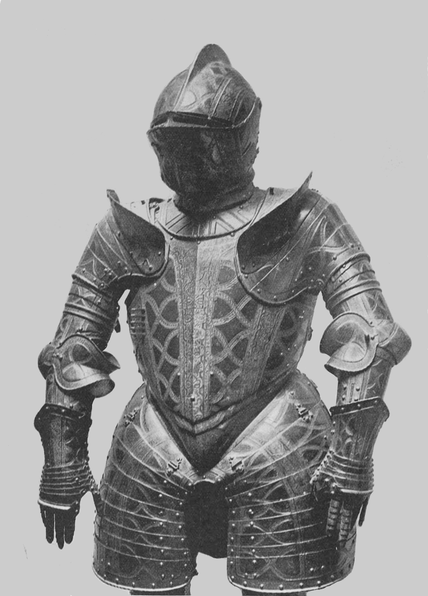 Sixteenth century Armet of rare form, with double visor. 29. Suit of parcel-gilt Armor. Made for Charles I. when prince. 30. Richly Embossed and Damascened Target. Italian, sixteenth century. 31. Target of Etched Steel. Italian or German, about 1550. 32. Roundel, with National Badges and Inscription. 33. Hilt of Two-handed Sword with the Bear and Ragged Staff on the Pommel and Quillons in chased steel. 34. Venetian Cinquedea, engraved, with Ivory Handle. 35. Main-Gauche with Steel Hilt. 36. Main-Gauche with Silver Guard. 37. Rapier with Silver Guard. 39. Pistol by Lazarino Cominazzo. 40. Early German Wheel-lock Pistol, used by the Reiters. 41. Richly Decorated Flint-lock. Probably Spanish. 42. Snap-hance of Italian make, about 1640. 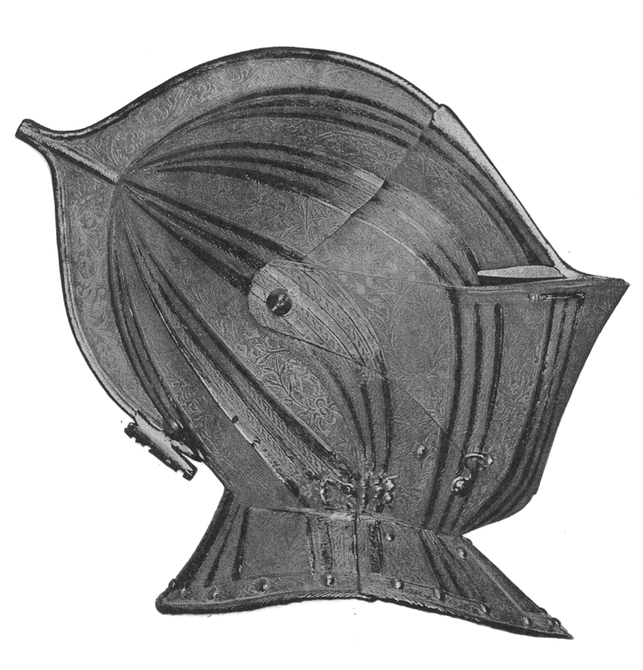 Profile of the helmet belonging to the French suit (Fig 32). In the guard-chamber of Windsor Castle. Breast-plate, embossed and parcel-gilt. French, Collection of Mr. David Currie.